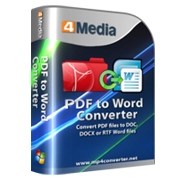 4Media PDF to Word Converter provides the most convenient solution to help you convert PDF files to Word files without any modification on the source files. You can convert PDF files to Word files in format of DOC, DOCX or RTF according to your system environment and personal preference. You can preview PDF files in thumbnail mode on any page you want. Page-flipping buttons are offered and you are also allowed to enter the page number manually to look through files. 4Media PDF to Word Converter enables you to select page ranges to convert: current page, whole pages or pages in a certain range. Convenient and easy-to-use, 4Media PDF to Word Converter is the best choice for you to convert PDF to Word. 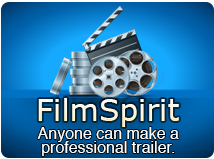 Have a free trial right now! Convert PDF files to Word files in fast speed and preserve all original formats and structure in converted files, saving you much time and effort. According to differences on personal demands as well as system environments, multiple profiles are supported: DOC, DOCX and Rich Text Format (*.rtf). 4Media PDF to Word Converter will keep all the original formats and elements in source PDF files in converted Word files. Super performance and fast processing speed make converting tasks complete efficiently and effortlessly. Using this PDF to Word converter, you can preview PDF files in thumbnail mode clearly without Adobe Acrobat or Adobe Reader. It is your choice to decide which page(s) to convert, the current page, the whole pages, or one page from another. Background running is offered in 4Media PDF to Word Converter to promote the performance of your computer. Auto-exit the application, shut down, hibernate, standby the computer automatically or do nothing after a PDF to Word conversion task is completed.